The systemic administration of IL-2 can act as a potent adjuvant for T cell-directed vaccine strategies. However, not only is the administration of IL-2 potentially toxic, but recent evidence suggests that it may also paradoxically limit the duration and magnitude of the cytotoxic T cell response. A recently identified cytokine, IL-15, shares many properties with IL-2 and may provide a preferential means of augmenting T cell-directed vaccine responses. Although well characterized in vitro, there are few data on the ability of IL-15 to augment T cell-mediated responses in vivo. We therefore evaluated the ability of systemic IL-15 to function as a T cell adjuvant in a murine vaccine model. To establish a population of easily identifiable Ag-responsive T cells, naive CD8+ (OT-1) T cells were first adoptively transferred into mice. Vaccination with peptide-pulsed dendritic cells induced a modest expansion of OT-1 T cells. The addition of systemic IL-15 for 7 days following vaccination resulted in a significant increase in the expansion of responding T cells in the PBL, spleen, and lymph nodes. Importantly, the responding T cells were cytotoxic and maintained a Tc1-biased phenotype. We did not observe either enhanced resistance to activation-induced cell death or preferential generation of memory T cells as a result of treatment with IL-15 compared with IL-2. These studies show for the first time that IL-15 is capable of augmenting the primary CD8+ T cell response to vaccination and contribute to the basis for future experiments exploring the clinical role of IL-15. The systemic administration of IL-2 can act as a potent adjuvant to vaccination and other strategies designed to augment T cell-mediated immune responses (1, 2, 3, 4, 5, 6, 7). High dose IL-2, however, can be associated with systemic toxicity, limiting its the effectiveness in patients (8, 9, 10, 11, 12, 13, 14). Despite IL-2’s well-known role as a promoter of T cell proliferation and activity (15, 16, 17, 18), IL-2 may paradoxically play a key role in limiting the duration of the T cell response (19, 20, 21, 22, 23, 24). Evidence for this is dramatically exemplified in IL-2 knockout (KO)2 mice, which exhibit T cell-mediated autoimmunity (25, 26). However, the ability of IL-2 to act in a suppressive manner toward responding T cells has also been reported in alternative settings not involving knockout mice (19, 27, 28, 29, 30, 31, 32, 33, 34, 35, 36, 37). A recently identified cytokine, IL-15, has been well characterized as a T cell growth factor in vitro and in some studies in vivo (38, 39, 40, 41, 42, 43, 44, 45, 46, 47, 48, 49). While IL-15 and IL-2 share little primary sequence homology, structurally they are similar, and both are members of the four α helix bundle family. Each uses a heterotrimeric receptor composed of a shared β- and γ-chains, but incorporating a private α-chain. Although signaling can occur through engagement of only the β- and γ-chains, inclusion of the α-chain allows for high affinity binding of the complementary cytokine (50, 51). While IL-2 is mainly produced by T cells, IL-15 is not produced by T cells, but is produced by a wide range of non-T cells, including monocytes, skeletal muscle, kidney, lung, and heart among other tissues (39, 45, 52). These and other (46, 47) properties associated with IL-2 and IL-15 suggest that there may be differential toxicities associated with the exogenous administration of IL-15. In addition to being potentially less toxic, IL-15 may act without the regulatory qualities associated with IL-2, thus providing another potential rationale for its use in T cell vaccination strategies. Evidence supporting this possibility is most strikingly apparent in IL-15 KO mice. In contrast with IL-2 KO mice, IL-15 KO mice have only minor immune deficiencies and no autoimmunity (53). (Similar differences are observed in the IL-2 and IL-15 specific α-chain receptor KO mice (26, 54, 55).) Another difference between IL-15 and IL-2 is their functional activity on memory T cell survival. In contrast with IL-2, which inhibits the survival of memory T cells in vivo, IL-15 augments the proliferation of memory T cells (28, 30, 56). The mechanisms responsible for these widely discrepant functional properties are poorly understood. The ability of IL-2 to induce susceptibility to activation-induced cell death (AICD) and the ability of IL-15 to induce resistance to AICD are commonly cited as potential mechanisms, but multiple factors are probably involved (20, 21, 22, 23, 24, 27, 57, 58, 59, 60, 61, 62, 63). Despite significant in vitro data supporting the utility of IL-15 as a T cell growth factor, there are relatively few published data evaluating the function of IL-15 on T cells in vivo (41, 43, 44, 64). In fact, to our knowledge, despite its potential utility as an immunotherapeutic adjuvant, there have been no reports addressing the ability of systemically administered IL-15 to augment primary T cell-mediated responses. The importance of delineating the in vivo role of IL-15 is underscored by recent work showing that the pattern of cytokine receptor subunit expression observed in vitro was much different from that observed in vivo (19). Thus, the requirements for T cell growth and their resulting functional characteristics may be very dependent on locale, and in vitro experiments may therefore be of limited value compared with in vivo studies. To address the role of IL-15 in vivo, we evaluated the ability of systemically administered IL-15 to augment a CD8+ T cell-specific vaccine response in mice. We show that the administration of exogenous IL-15 for 1 wk significantly augmented the expansion of the primary responding CD8+ T cell population. Importantly, in qualitative terms, the responding T cells exhibited characteristics associated with therapeutically valuable T cells. All mice used were 6–14 wk old, purchased from The Jackson Laboratory (Bar Harbor, ME), and maintained in specific pathogen-free conditions at the Medical University of South Carolina in accordance with National Institutes of Health guidelines. C57BL/6-Ly5.1 (B6.SJL-PtprcaPep3b/BoyJ) are congenic to wild-type C57BL/6-Ly5.2 mice at the Ly5 (CD45) allele (65), the use of which allowed us to distinguish donor T cells from host cells following adoptive transfer. OT-1 TCR transgenic mice express the OT-1 TCR (Vα2/Vβ5) transgene, encoding a TCR specific for the OVA epitope (SIINFEKL-H2Kb) (66). Hemizygous OT-1 TCR transgenic mice were maintained on a C57BL/6-Ly5.1 background and assessed for transgene status by flow cytometric analysis of peripheral blood with an Ab against the Vα2 subunit. The following mAbs were used for this study: A20, anti-Ly5.1 (CD45.1); 53-6.7, anti-CD8; XMG1.2, anti-INFγ; 11B11, anti-IL-4; 2.4G2, B20.1, anti-Vα2; 145-2C11, anti-CD3; 3C7, anti-CD25; MEL-14, anti-CD62L; IM7, anti-CD44; R1-2, anti-CD49d; 3/23, anti-CD40; RA3-682, anti-CD45R/B220; HL3, anti-CD11c; 16-10A1, anti-CD80; GL1, anti-CD86; S4B6, anti-IL-2; and FC Block (all from BD PharMingen, San Diego, CA). Human IL-15, murine IL-2 (mIL-2), mIL-4, and mGM-CSF were reconstituted in 0.1% BSA/PBS and stored at 4°C immediately before use according to the manufacturer’s recommendations (R&D Systems, Minneapolis, MN). The SIINFEKL peptide (OVA H-2Kb epitope) was synthesized by American Peptide (Sunnyvale, CA). All cell lines were maintained in complete medium consisting of RPMI (Cellgro, Herndon, VA), 10% FBS (HyClone, Logan, UT), 300 μg/ml l-glutamine (Cellgro), 100 nM nonessential amino acids (Life Technologies, Grand Island, NY), 5.5 × 10−5 M 2-ME (Life Technologies), 1 mM sodium pyruvate (Life Technologies), 100 IU/ml penicillin (Cellgro), 10 μg/ml streptomycin (Cellgro), and 10 μg/ml gentamicin reagent solution (Life Technologies). The EL-4 tumor (American Type Culture Collection, Manassas, VA) is a thymoma derived from C57BL/6-Ly5.2 mice (67). OVA-transfected EL-4 cells, E.G7-ova (American Type Culture Collection), were grown in complete medium supplemented with 500 μg/ml Geneticin (or G418; Life Technologies) (68). Bone marrow-derived DC were generated as previously described (69, 70). Briefly, bone marrow cells were flushed from the femurs and tibias of mice and then depleted of RBC by lysis with ACK buffer (Biofluids, Camarillo, CA). Cells were then supplemented with mGM-CSF (20 ng/ml) and mIL-4 (20 ng/ml) and plated out at 1 × 106 cells/ml. On day 4 of culture, complete medium with 20 ng/ml mGM-CSF and 20 ng/ml mIL-4 was added to increase the total volume by 50%. On day 7, nonadherent and loosely adherent cells were harvested and layered onto a gradient (14.5% metrizamide in complete medium; Sigma-Aldrich, St. Louis, MO) and centrifuged. Enriched DCs were washed and, except in control conditions, pulsed with 5 μg/ml SIINFEKL peptide for 3 h, then washed three times in complete medium. The maturity and phenotype of the enriched DC were confirmed by the flow cytometric expression of CD80, CD86, CD40, and CD11c and the lack of CD45R. Adoptive T cell transfers were performed using modifications of previously described protocols (71, 72). Spleen cells were harvested from OT-1 mice (Ly5.1), prepared as a single-cell suspension, and lysed with ACK buffer to remove RBC. Subsequently, ∼2.5 × 106 spleen cells resuspended in 300 μl HBSS were injected i.v. into unirradiated C57BL/6 (Ly5.2) mice. Mice were then rested for 2 days and then vaccinated with ∼1.4 × 106 Ag-pulsed or sham (unpulsed) DC resuspended in 400 μl. Following vaccination, mice received i.p. injections of cytokine (0.5 μg human IL-15 or 0.2 or 1 μg mIL-2) every 12 h for 7 days. Recombinant cytokine was diluted with HBSS into 100-μl doses prepared fresh for each injection. In some experiments mice were injected with vehicle alone as a control. At various time points after vaccination, mice were anesthetized, and peripheral blood was harvested by retro-orbital draw. At other time points, mice were sacrificed, and spleen and lymph nodes (inguinal, axillary, and brachial) were isolated and homogenized into a single-cell suspension. RBC from the peripheral blood and spleen were removed by lysis using ACK buffer. Following the lysis step, a portion of splenocytes was diverted for use in functional assays as described below. The remaining cells were then analyzed by flow cytometric analysis as previously described (73). Briefly, cells were washed in FACS buffer consisting of 0.5% BSA and 0.02% sodium azide in HBSS. Cells were prestained with FC block for 5 min at 4°C, incubated with mAb for 30 min at 4°C, and washed twice before analysis. Cell surface immunofluorescence was measured using a FACSCalibur flow cytometer (BD Biosciences, San Jose, CA) and was analyzed with CellQuest software (BD Biosciences). Cytolytic T cell activity was determined by 4-h 51Cr release assay, as previously described (73). Briefly, 51Cr-labeled target cells, either EL4 cells or EL4 cells pulsed with SIINFEKL peptide, were incubated with fresh splenocytes in 96-well U-bottom plates for 4 h at 37°C with 5% CO2. Culture supernatant was then harvested, and radioactivity was determined. The percentage of specific 51Cr release was calculated according to the equation: percent specific lysis = [(experimental release − spontaneous release)/maximum release minus spontaneous release] × 100. Spontaneous release was determined by incubation of targets in the absence of effectors, while maximum target release was determined by treatment of cells with 9% Triton X solution. Intracellular cytokine expression was detected using the Cytofix/Cytoperm Plus Kit with GolgiStop (BD PharMingen), using a modification of previously described methodology (74). Splenocytes (1 × 105) were combined with 1 × 105 target cells in a 96-well, round-bottom plate in a total volume of 200 μl. Target cells consisted of either EL4 cells alone or EL4 cells pulsed with SIINFEKL peptide. Following coculture of effectors and targets for 12 h, cells were stained with anti-Ly5.1 Ab to distinguish adoptively transferred donor T cells (Ly5.1) from either host splenocytes (Ly5.2) or EL4 target cells (Ly5.2). Subsequently, intracellular cytokine expression was determined using Abs against IFN-γ and IL-4 and the use of the Cytofix/Cytoperm Kit with GolgiStop (BD PharMingen). Positive control conditions for this protocol were initially established using the Leukocyte Activation Cocktail (BD PharMingen; contains PMA and ionomycin) to induce intracellular cytokine expression. Cell surface immunofluorescence was measured using a FACSCalibur flow and was analyzed with CellQuest software. AICD was assessed by ex vivo restimulation of splenocytes with anti-CD3 plate-bound Ab, and subsequent assessment of apoptosis was performed with propidium iodide (PI) using a modification of previously described methodology (59). Briefly, 96-well, round-bottom plates (plate 3799; Costar, Corning, NY) were precoated with anti-CD3 (clone 145-2C11; BD PharMingen), after which 2 × 105 splenocytes were added. Following a 24-h incubation, cells were stained with anti-Ly5.1 Ab to distinguish donor T cells from either host or target cells, and apoptosis was determined by staining with PI (Sigma-Aldrich) according to the manufacturer’s directions. Cell surface immunofluorescence was then measured using a FACSCalibur flow cytometer and was analyzed with CellQuest software. To address the utility of administering systemic IL-15 as an adjuvant to vaccination, we used a murine adoptive T cell transfervaccine model. By first adoptively transferring naive CD8+ TCR (OT-1) transgenic T cells (Ly5.1) into C57BL/6 (Ly5.2) congenic mice, we established a baseline of easily identifiable T cells of uniform Ag specificity. Upon vaccination with DC pulsed with the relevant peptide (SIINFEKL), these OT-1 T cells proliferated vigorously in a manner easily discernible by flow cytometric analysis by virtue of their unique congenic Ly5.1 marker. Using this model, we typically observed that in PBL, the responding OT-1 T cells expanded to a peak of ∼10% by day 4 (Fig. 1⇓ and data not shown). Postvaccination administration of systemic IL-15 augments the percentage of OT-1 T cells in the peripheral blood. After adoptive T cell transfer, mice were given sham vaccine (DC without peptide), vaccine alone (DC with SIINFEKL peptide), or vaccine plus IL-15 (DC with SIINFEKL peptide and 0.5 μg IL-15 i.p. every 12 h for 7 days). Results indicated by an asterisk were significantly different from each other (p < 0.001) as determined by Student’s two-tailed t test. Data shown are representative of four independent experiments (each with three mice per group). The addition of systemic IL-15 administered i.p. every 12 h for 1 wk resulted in an extended period of OT-1 T cell expansion and ultimately a 3-fold increase in the peak percentage of OT-1 T cells (Fig. 1⇑). This increase was not limited to the peripheral blood, as a similar phenomenon was seen in the spleen and to a lesser extent in the lymph nodes (Fig. 2⇓). In addition, administration of the well-established T cell adjuvant, IL-2, augmented the vaccine response in a similar manner to IL-15 (Fig. 2⇓). 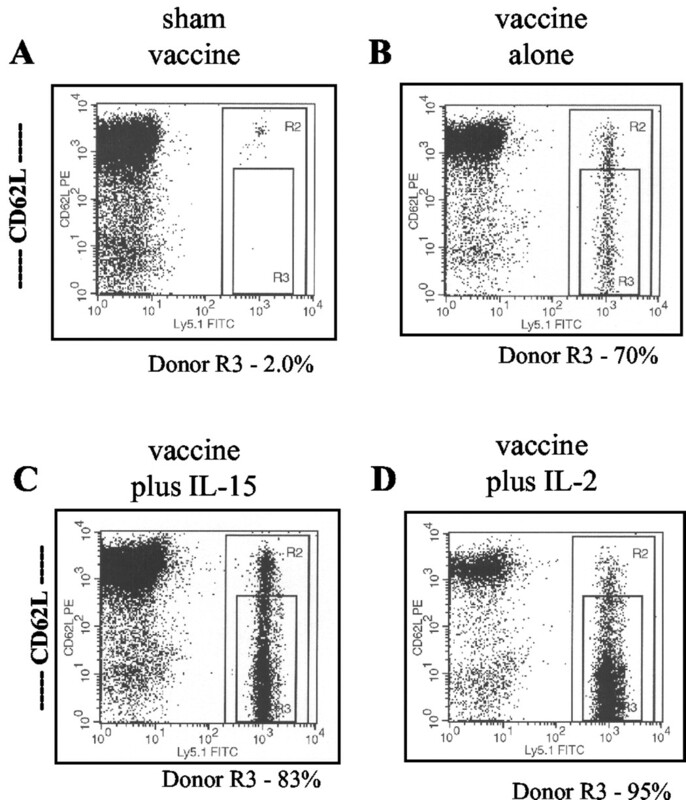 Postvaccination administration of systemic IL-15 augments the percentage of OT-1 T cells in the spleen and lymph nodes. All mice received adoptive T cell transfer followed by either sham vaccine (DC without peptide), vaccine alone (DC with SIINFEKL peptide), vaccine plus IL-15 (DC with SIINFEKL peptide and 0.5 μg IL-15 i.p. every 12 h for 7 days), or vaccine plus IL-2 (DC with SIINFEKL peptide and 0.2 μg IL-2 i.p. every 12 h for 7 days). Cells were harvested 7 days postvaccination. Similar results were obtained on day 11. Results indicated by an asterisk were significantly different from each other (vaccine alone vs vaccine plus IL-15; p < 0.05) as determined by Student’s two-tailed t test. Data shown are representative of two independent experiments (each with two mice per group). The responding OT-1 T cells were assessed by flow cytometric analysis for phenotypic changes subsequent to IL-15 administration. Among activation markers, a minor reduction in expression of the adhesion molecule CD62L (L-selectin) was observed with both IL-15 and IL-2 administration (Fig. 3⇓). Although we examined the expression of other activation markers (CD44, CD69, CD11b, and CD49d) that were modulated as a result of vaccination, we did not observe any detectable impact upon these as a result of systemic cytokine administration (data not shown). Additionally, we were unable to detect expression of the IL-2 α-chain receptor subunit (CD25) on a significant percentage of responding T cells in any condition, although expression was readily detectable when T cells were stimulated in vitro (data not shown). Postvaccination expression of CD62L in responding OT-1 T cells. Responding OT-1 T cells from the peripheral blood on day 6 following vaccination were evaluated for CD62L expression. The number (R3) shown indicates the percentage of donor OT-1 T cells (Ly5.1+) down-regulating CD62L expression as defined by entry into the R3 quadrant. Conditions shown include sham vaccine (A; DC without peptide), vaccine alone (B; DC with SIINFEKL peptide), vaccine plus IL-15 (C; DC with SIINFEKL peptide and 0.5 μg IL-15 i.p. every 12 h for 7 days), and vaccine plus IL-2 (D; DC with SIINFEKL peptide and 1 μg IL-2 i.p. every 12 h for 7 days). Results are representative of multiple time points from three independent experiments. It has been reported that T cells lose expression of the anti-apoptotic protein Bcl-2 (75) following activation, and that this expression is only restored upon conversion to a memory T cell (76). As IL-2 induces the up-regulation of Bcl-2 both in vitro and in vivo, it is postulated that this mechanism may account for part of the ability of IL-2 to augment T cell responses (77, 78). Since IL-2-induced Bcl-2 expression is known to be dependent on signaling through the shared γ-chain receptor subunit, we anticipated that IL-15 might also up-regulate Bcl-2 in vivo (79). As others have observed in vitro (55, 80), we found that in vivo administration of IL-15 augmented Bcl-2 expression in a manner similar to that observed with IL-2 (Fig. 4⇓). This increase in Bcl-2 expression was observed only at the time points when cytokine was being administered (data not shown). These results suggest, at least partially, that a shared mechanism used by both IL-15 and IL-2 augments the magnitude of the responding T cells. Postvaccination expression of Bcl-2 in responding OT-1 T cells. Up-regulation of the anti-apoptotic protein, Bcl-2 in responding T cells from the peripheral blood on day 6 following vaccination. The number shown indicates the geometric mean of the donor OT-1 T cells (Ly5.1+) for Bcl-2 expression. Conditions shown include sham vaccine (A; DC without peptide), vaccine alone (B; DC with SIINFEKL peptide), vaccine plus IL-15 (C; DC with SIINFEKL peptide and 0.5 μg IL-15 i.p. every 12 h for 7 days), and vaccine plus IL-2 (D; DC with SIINFEKL peptide and 1 μg IL-2 i.p. every 12 h for 7 days). Results are representative of similar data obtained in two independent experiments also including time points on day 4 following vaccination (data not shown). Having shown that exogenous IL-15 resulted in a quantitative increase in the frequency of responding T cells, it was also important to evaluate the responding T cells qualitatively. Two characteristics identifying responding T cells as qualitatively valuable are Ag-specific cytotoxicity and Tc1-biased cytokine production (81, 82, 83). We demonstrated the first of these by showing that responding T cells, harvested from the spleens of mice vaccinated 7 days earlier and treated with IL-15, functioned in a cytotoxic manner against target cells pulsed with relevant Ag (25% target lysis at an E:T cell ratio of 100:1; Fig. 5⇓A). As reported previously (5, 6), similar results were obtained with mice treated with IL-2 (20% target lysis at an E:T cell ratio of 100:1; Fig. 5⇓B). Sham-vaccinated mice and mice receiving vaccination without cytokine did not show evidence of a cytotoxic response with these assay conditions (data not shown). In vitro cytotoxicity of postvaccination splenocytes. Mice received adoptive T cell transfer followed by vaccine plus IL-15 (A; DC with SIINFEKL peptide and 0.5 μg IL-15 i.p. every 12 h for 7 days) or vaccine plus IL-2 (B; DC with SIINFEKL peptide and 0.2 μg IL-2 i.p. every 12 h for 7 days). On day 7 postvaccination, spleen cells were harvested and used as effector cells. Target cells consisted of either EL4 cells pulsed with SIINFEKL peptide or control EL4 cells without peptide. The E:T cell ratio shown indicates the ratio of the bulk population of splenocytes vs the number of 51Cr-labeled target cells. The percentages of OT-1 T cells within each of these bulk effector populations used were 11% (A) and 5% (B). Sham-vaccinated mice and mice receiving vaccination without cytokine did not show evidence of a cytotoxic response (data not shown). The lack of cytotoxicity in the latter group almost certainly reflected the presence of a lower frequency (1%) of Ag-specific OT-1 T cells. Shown are results from one of two mice in each group evaluated. Results are representative of two similar experiments. In addition to the responding T cells being cytotoxic, they readily produced IFN-γ in response to relevant Ag for all vaccine conditions (>60% of the OT-1 T cells stained positively for intracellular IFN-γ cytokine production compared with <5% in the control groups; Fig. 6⇓). As none of these T cells produced significant amounts of IL-4, they exhibited a phenotype consistent with a strong Tc1 bias (81, 82, 83). Thus, despite the increase in frequency of responding OT-1 T cells induced by IL-15, these T cells maintained a qualitative phenotype consistent with that observed in therapeutically valuable T cells. Tc1 vs Tc2 bias of postvaccination OT-1 T cells. 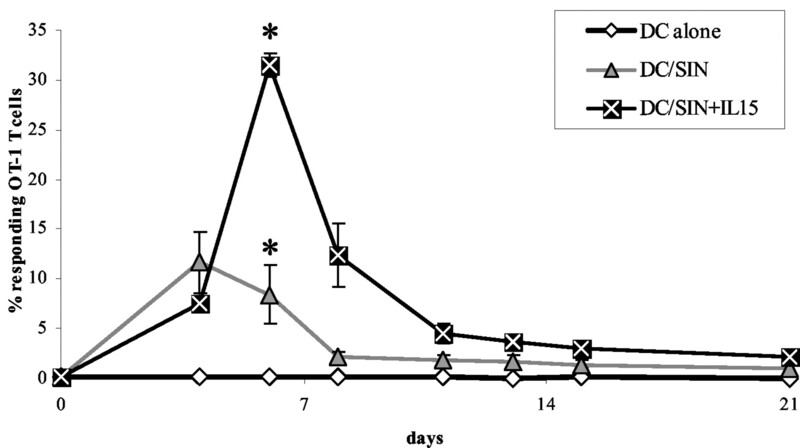 Splenocytes obtained from mice 6 days postvaccination were assessed for the ability to produce IFN-γ (A) or IL-4 (B) following peptide stimulation via staining for intracellular cytokine production. Splenocytes were stimulated by coculture for 12 h with either EL4 cells pulsed with the SIINFEKL peptide or EL4 cells alone. Before intracellular staining, OT-1 donor T cells were identified by staining with the anti-Ly5.1 Ab. Conditions tested include sham vaccine (DC without peptide), vaccine alone (DC with SIINFEKL peptide), vaccine plus IL-15 (DC with SIINFEKL peptide and 0.5 μg IL-15 i.p. every 12 h for 7 days), or vaccine plus IL-2 (DC with SIINFEKL peptide and 1 μg IL-2 i.p. every 12 h for 7 days). Shown are data from one of two mice in each group evaluated for this experiment. Results are representative of two independent experiments. The responding OT-1 T cells from each group were also tested for susceptibility to AICD. AICD occurs when T cells previously activated are reactivated through TCR signaling and is characterized by the induction of apoptosis in a large fraction of T cells (84). In contrast with IL-2, which is thought to confer susceptibility to AICD (27), there are conflicting reports regarding the role of IL-15 in AICD. Some reports suggest that IL-15 may promote resistance to AICD (57, 58, 59, 61), and other reports suggest that IL-15 may not have a regulatory role in AICD (31). To evaluate these potential properties in our model, we induced AICD ex vivo in responding T cells 7 days postvaccination. Although stimulation of T cells with plate-bound anti-CD3 enhanced apoptosis in T cells from vaccinated mice (62% PI positive in contrast to 34% PI positive from sham-vaccinated mice), we did not observe any significant differential AICD in mice received vaccination plus either IL-15 or IL-2 (70 and 68% PI positive, respectively; Fig. 7⇓). Postvaccination AICD of ex vivo OT-1 responder T cells. Splenocytes harvested from mice 6 days following vaccination were stimulated with plate-bound anti-CD3 mAb. Apoptotic cells were determined by PI staining. Donor OT-1 T cells were identified by the Ly5.1 Ag. Conditions tested include sham vaccine (DC without peptide), vaccine alone (DC with SIINFEKL peptide), vaccine plus IL-15 (DC with SIINFEKL peptide and 0.5 μg IL-15 i.p. every 12 h for 7 days), or vaccine plus IL-2 (DC with SIINFEKL peptide and 1 μg IL-2 i.p. every 12 h for 7 days). The final qualitative property we assessed in the T cells responding to vaccination was their ability to make the transition into memory T cells. In contrast to mice receiving a sham vaccine, mice receiving the vaccine alone generated a relatively stable population of donor T cells after ∼1 mo (Fig. 8⇓). These results are similar to what was previously observed (85). These cells were characterized by the expression of CD44 and a reinduction of CD62L expression indicative of a memory T cell phenotype (57, 85, 86). Using these criteria, we assessed the effects of administration of IL-15 or IL-2 during the primary response on the generation of memory T cells. No statistically significant change in the percentage of memory T cells as a result of IL-15 or IL-2 administration in four independent experiments was observed (Fig. 8⇓). Postvaccination OT-1 memory T cells in the PBL. Two to 4 mo following vaccination, the percentage of donor OT-1 T cells in the PBL was determined by staining with the Ly5.1-donor specific Ab. Donor T cells were characterized as memory T cells based on their CD44+ CD62L+ phenotype. Conditions tested include sham vaccine (DC without peptide), vaccine alone (DC with SIINFEKL peptide), vaccine plus IL-15 (DC with SIINFEKL peptide and 0.5 μg IL-15 i.p. every 12 h for 7 days), or vaccine plus IL-2 (DC with SIINFEKL peptide and 1 μg IL-2 i.p. every 12 h for 7 days). Results shown include four experiments combined (as indicated) for presentation. Our data show for the first time in an in vivo model that systemic administration of IL-15 results in augmentation of the primary CD8+ T cell response following vaccination. This enhanced response is manifest in terms of an enhanced quantitative response (increase in the percentage of Ag-specific T cells by flow cytometry) and an enhanced functional response (increase in specific cytotoxic capacity). Furthermore, it is evident that individual responding T cells maintain their qualitative ability. This was evident in that responding T cells exhibited ex vivo Ag-specific cytotoxicity as well as the maintenance of a Tc1-biased phenotype. These results are important, as quantitative and qualitative augmentation of T cell responses following vaccination do not always occur in tandem (87). 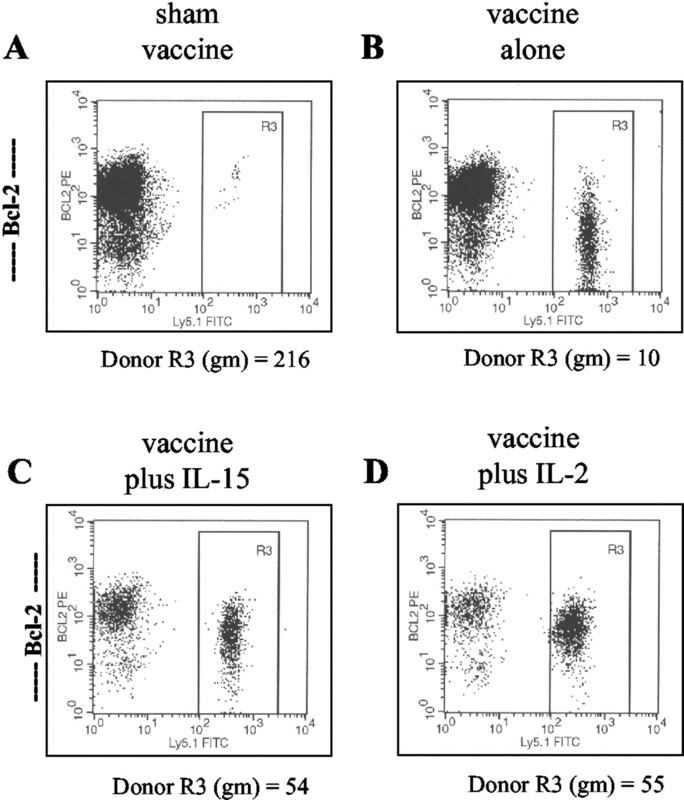 Furthermore, our results showing the ability of IL-15 to augment the expansion of primary responding T cells following vaccination are of particular importance because they were obtained using an in vivo model, with which the role of systemically administered IL-15 has not been previously addressed. While our results clearly established the ability of IL-15 to augment the T cell response following vaccination, we found no CD8+ T cell response advantage between IL-15 and IL-2. Both cytokines induced comparable kinetic responses, suggesting that in our model each cytokine was acting through a similar mechanism, possiblly including use of the Bcl-2 pathway. Aside from similar phenotypic changes, both IL-15 and IL-2 yielded comparable results upon analysis of cytotoxicity and cytokine production in the responding T cells. Additionally, we found no evidence for a differential effect of these cytokines on AICD. Finally, in our model upon the assessment of memory T cell generation, we found no advantage of IL-15 over IL-2. As cytokine was administered before the conversion of responding T cells to the memory cell phenotype, our results suggest that the negative regulatory effects of IL-2 on memory T cells may not be mediated through the precursors of memory T cells. The lack of preferential T cell response induced by IL-15 relative to IL-2 may reflect unique attributes specific to our model as opposed to inconsistencies with previous studies. For example, in contrast with most previous in vivo studies, our study did not employ blocking Abs or KO mice. Thus, if IL-2 is acting negatively in a dominant fashion, the endogenous IL-2 might be sufficient to satiate the negative signaling to responding T cells. In this case, the addition of IL-15 may augment T cell expansion, but only in a similar manner to that observed from the positive effects of exogenous IL-2. Although the possible ability of IL-2 to act in a dominant negative fashion might be detrimental to the therapeutic application of IL-15, this potential problem could be circumvented by the use of blocking reagents against the IL-2 pathway. Our model may prove useful in testing this hypothesis. Another potential difference observed in our model was lack of specific IL-2 α-chain receptor (CD25) expression on responding T cells. This may either be a necessary factor or an indicator of T cell susceptibility to the regulatory ability of IL-2 (19). Based on the data obtained, the most practical potential application of IL-15 is as a less toxic alternative to IL-2. Although IL-2 has a reproducible level of clinical efficacy (1, 2, 3, 4), its application has been limited by the significant toxicities associated with its systemic administration. While preliminary evidence suggests the possibility of favorable toxicity associated with IL-15 (88, 89), these studies would need to be expanded upon to determine the therapeutic index of IL-15 relative to IL-2. Should IL-15 prove advantageous, it might be an interesting alternative to one recent approach involving the creation of an IL-2 mutein by targeted mutagenesis (90). This mutein selectively engages T cells expressing the specific IL-2 receptor α-chain (CD25), which may not be advantageous compared with IL-15. In addition to reduced toxicity, another potential advantage of IL-15 over IL-2 as a vaccine adjuvant is highlighted by its unique functional properties. Unlike IL-2, IL-15 has not been shown to exhibit regulatory qualities on T cell function. While the negative regulatory effects of IL-2 have been extensively reported, these studies have been focused almost exclusively on nontherapeutic settings (19, 23, 25, 26, 27, 28, 29, 30, 31, 32, 53, 54, 55). However, in support of the ability of IL-2 to induce suppressive effects in a therapeutic model, there are several murine studies demonstrating an IL-2-mediated inhibitory effect on T cell function (24, 34, 35, 36, 37, 91, 92). The ability of IL-15 to promote T cell activity in vivo may provide a mechanism to circumvent not only the inhibitory effects seen in these murine models, but also the potential inhibitory effects of IL-2 that may otherwise be masked in clinically relevant settings. In agreement with this hypothesis, a recent report by Li et al. (19) not only confirmed the negative regulatory role of IL-2 in vivo, but showed in a mouse model that IL-15 provides the necessary signals to sustain initial T cell proliferation following stimulation. These results were particularly significant, in that they demonstrated that, contrary to many in vitro results, IL-2 did not mediate the critical signals supporting T cell proliferation in vivo. Consequently, not only do these results propose potential drawbacks to the use of IL-2 to augment T cell-mediated responses, but they also provide evidence supporting the utility of IL-15 as an alternative. While the study by Li et al. (19) provides evidence for a direct negative role of IL-2 on responding T cells, an as yet poorly characterized avenue is the indirect effects of suppressor T cells, which are interestingly often characterized by the expression of the specific IL-2R α-chain (CD25). Initial evidence supporting the role of suppressor T cells in mediating IL-2 regulation of CD8+ memory T cells has recently been published (63). It will be interesting to evaluate in what other circumstances suppressor T cells might mediate the negative regulatory effects of IL-2, and whether IL-15 might differentially regulate the effects of such suppressor T cells. Regardless of the ability of IL-15 to improve upon T cell functional ability relative to IL-2, our results clearly demonstrate the potential for IL-15 to function as an adjuvant to T cell-directed immunotherapies. Additional questions yet to be addressed include the optimal timing and duration for administration of IL-15. The beneficial effects of IL-2 have been reported to be primarily during the first 7 days following vaccination (5). Given the potential for differential regulatory mechanisms, IL-15 might prove superior when administered in an extended manner. Furthermore, the ability of IL-15 to function in a preferred manner to IL-2 may be more apparent in a tumor model where Ag persists. Although our work failed to reveal a role of IL-2 in susceptibility to AICD in vitro, a recent report in which Ag persisted in vivo by virtue of a tumor clearly demonstrated a negative regulatory role for extended IL-2 administration (24). Ultimately, however, evaluation of the therapeutic index of IL-15 may yield the most important criteria for incorporation of IL-15 into human therapeutic trials, as toxicity of IL-2 is the most fundamental clinical limitation. Moreover, as IL-15 and IL-2 may induce different types of toxicity, it might be of value not only to evaluate them as individual agents but when given concomitantly. We thank Rick Peppler and Candace Enockson for excellent help with the flow cytometric analysis. ↵2 Abbreviations used in this paper: KO, knockout; AICD, activation-induced cell death; DC, dendritic cells; m, murine; PI, propidium iodide. Rosenberg, S. A., V. T. DeVita, S. Hellman. 1995. Biologic Therapy of Cancer xvii Lippincott, Philadelphia. Rosenberg, S. A.. 2000. Principles and Practice of the Biologic Therapy of Cancer Lippincott-Williams & Wilkins, Philadelphia.